Every development project in some way has to deal with hierarchical data. That comes in the form of catalogs, cascading choices etc. In my previous article I demonstrated a way to maintain simple 2 level hierarchical data. In this article I will demonstrated the most optimal way of storing deep hierarchical data, that cannot be efficiently maintained using key-value pair setup. 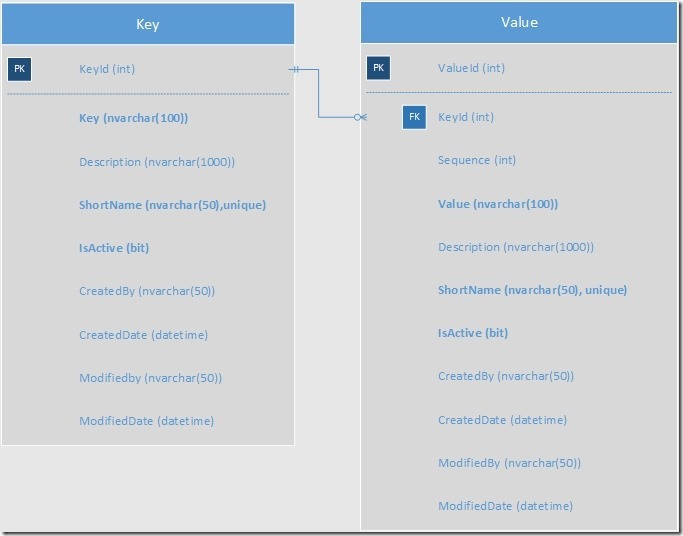 The way to do this is by using a dedicated data type in SQL Server – HierarchyId. The article will not go deep into explaining about hierarchyid or the methods that accompany it, but rather will show how to use the data type in real world scenarios. When you have to store a complex hierarchy, traversing and manipulating that hierarchy becomes a tedious task. Nested hierarchy that goes beyond a flat 2 tier level is better managed with the help of a dedicated data type in SQL Server – HierarchyId. HierarchyId is an in-built data-type in SQL Server and is based on CLR representation of binary data. It essentially stores an ordered path in an efficient manner. Because it is a CLR based data-types, there are methods that are available that can be leveraged in SQL queries to work with the data type. Although it is based on CLR, you do not have to take any additional steps in SQL Server to enable the use of the data type. It was first introduced in SQL Server 2008. I will use some of the methods in this article to show you how to maintain a simple hierarchy. I will be re-using the example from my previous post and will try to store a hierarchy of different types of vehicles depending upon the environment in which they can be used. In order to accommodate such a hierarchy, let’s create a data model. The data model in our case will only consists of a single table. 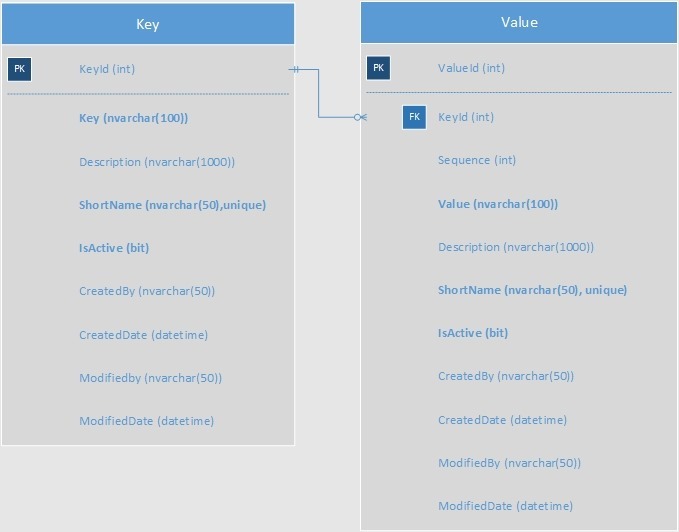 This table can then be connected to the rest of the tables in the main data model with the help of primary-foreign key relationship. Figure 2 Table that will capture the hierarchy. Bold entries are required. The auto incrementing integer type primary key. Binary representation of ordered path using data type hierarchyid. A computed column to show path of a node in the hierarchy as a string for our easy comprehension. A computed column to show level of a node in the hierarchy as am integer value for our easy comprehension. Entry denoting either a parent or child. Short string about node which will be leveraged in where clause in SQL queries. Bit field denoting if an entry is active or not. Entry to denote who actually created the entry. Entry denoting the date and time when the entry was created. Entry to denote who modified the entry. Entry denoting the date and time when the entry was modified. Contrast this with the data model as presented in the previous article. You will notice that in this case we are only using a single table to store both the parent and the child entries. As is done in the previous article, for our ease of querying, we will maintain a column called “ShortName” that will be used in where clause in all the queries. This makes the queries independent of the primary key column, in which the value may change as we move the data from one environment to another. 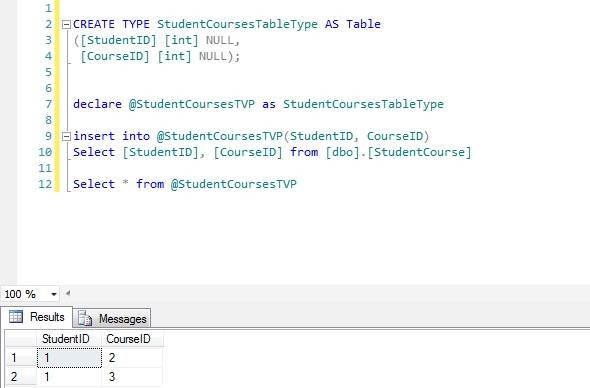 Now here’s the SQL that you can use to create the table and fill it up with data. 5. Finding the ancestor of a child node. -- Selecting the entire table contents. -- Finding the root element. -- Selecting a hierarhcy of nodes belonging to a parent. -- Getting level of a node in the hierarchy. -- Determining if a node is a child of a node. -- The query selects the immediate ancestor. 1. GetRoot(): GetRoot methods when used on a hierarchyid type value will return the hierarchyid type value of the absolute root of the hierarchy. 2. GetDescendant(): Methods when used on a hierarchyid type value will return a hierarchyid type value. You can use this method to generate a new hierarchyid value when inserting data, the way I have demonstrated. Notice that in order to create nodes that are siblings, you need to specify a pre-existing sibling (See the creation of water and air vehicles that are siblings to ground vehicles). Depending upon where you want to place the sibling in the hierarchy, you might need to provide both the sibling on the left and right in the hierarchy. Since I want to treat both air and water vehicles, I only mentioned sibling on the left in the hierarchy. If you want to place another category, say, amphibious vehicles between water and ground vehicles, then you will have to mention ground vehicles as the sibling on the left and water vehicles as the sibling on the right. 3. IsDescendantOf(): Method takes in a hierarchy id as input and returns a Boolean, if that is true. 4. GetAncestor(): Method takes in an integer value and gives the parent of the child node, depending on the integer value provided. The integer depicts the level in the hierarchy. As you can see in the code above, maintaining a deep hierarchy with the help of hierarchyid is easy. It does not require cumbersome recursive Common Table Expressions and multiple tables to maintain, and yet offers more flexibility. I have not gone deep into explaining about hierarchyid and the methods that accompany it. The main motive of this article is to demonstrate with the help of working code, how to maintain hierarchical data with the help of in-built mechanism in SQL Server. Often we are required to maintain simple 2 level hierarchical data in databases. 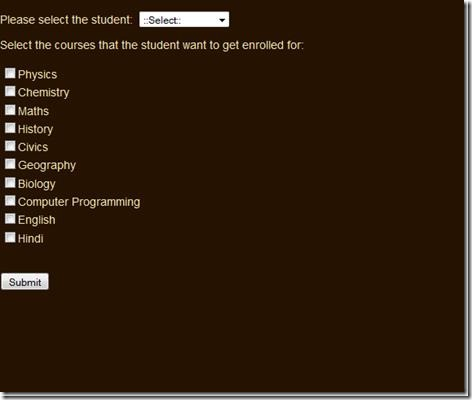 Such data is generally used to power dropdowns, radio button groups, checkboxes etc. where user input is required. This data is generally persisted in relational databases in separate tables which connect to the tables of interest via one to many relationships. This method suggests a key-value like system to maintain such data, thereby reducing the total number of tables and at the same time maintaining flexibility to extend your data-model. Often we are required to maintain simple 2 level hierarchical data in databases. Such data is generally used to power dropdowns, radio button groups, checkboxes etc. where user input is required. This data is generally persisted in relational databases in separate tables which connect to the tables of interest via one to many relationships. This method suggests a key-value like system to maintain such data, thereby reducing the total number of tables and at the same time maintaining flexibility to extend your data-model. I have been working on projects and have implemented a simple way to maintain simple 2 level hierarchical data. A lot of them were focused on replacing a Content Management System that has been in use since the last decade with small dedicated systems that are flexible and correspond to the changing business landscape. One concept that we borrowed from the legacy system was the system to maintain data that drive business logic in an application using key-value like 2 level hierarchical data. Since a CMS can be used to manage a variety of data that the company making the CMS cannot know about in advance, the pattern is used in such systems. At the heart of the concept are two tables – one to store parent data and the other table that houses child data. Hence key-value like one to many hierarchy. We will be modeling the kinds of transports that exist and the corresponding vehicles. Description: The data-model of the setup of key-value tables. Bold entries are required fields. The auto incrementing int type primary key. The entry that denotes the parent. Denotes whether the entry is active or not. Reference to the primary key ValueListID in ValueList table. The sequence denotes the order in which the child entries should appear in a select statement. This is helpful in defining an order in case of dropdowns. The entry that denotes the child of the parent entry in ValueList table. Description about the child entry. As you can see from the data model, the parent entries are kept in the Key table and the child entries are kept in the Value table. The two tables are related via one to many relationship. 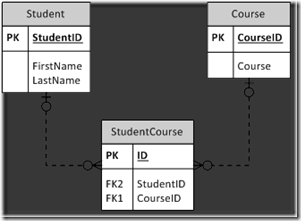 The role of the ShortName field in both the tables is to help in the creation of sql queries that include the where clause based on which selection can be done. Often data is moved from one environment to other, and in the process it may happen that the primary key may change. This is especially true of databases where uniqueidentifier data type keys are used as surrogate primary keys, like data models of content management systems. Now let’s create these tables and fill them up with some data. Key-Value tables form a very concise way to store 2 level hierarchical data. The idea is primarily applied in case of content management systems where the product company cannot know in advance as what all categories will be created in the system. Using this concept you can get rid of a lot of tables that are just used to store ‘choice’ or ‘category’ data. Boy it is good to be back!! If someone, somewhere has already invented a memory wipe, I would like to borrow it for a single use and would love to eradicate all the memories of the year 2014. Crazy year, which taught me a lot of things both on professional and personal fronts. 2014 certainly made me more mature person in terms of how to handle people both who I am working for and who I am working with. It ascertained the principles that have been imbibed in me from the very childhood to be a good human being first before being anything else, to be empathetic, and have patience in people. 2014 gave me experiences on a personal front that I did not wanted in the first place. But here I am..still sane, still moving on. What doesn't kill you, only makes you stronger. I hope to enjoy 2015 by writing quality posts and bring some contribution to my beloved community of developers. Have completed two open source projects, and will be writing about them shortly. 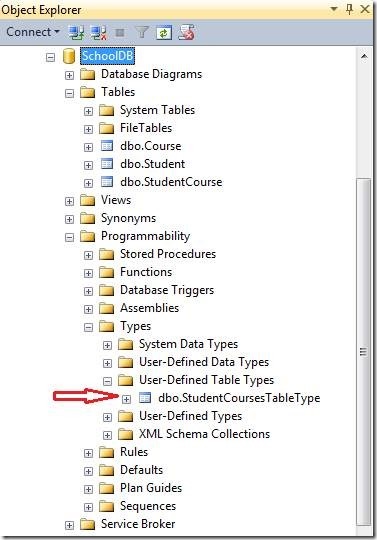 This post covers how can we insert multiple rows worth of data via table valued parameters in SQL Server database. In my last posts, I have described ways to insert multiple rows worth of data in a SQL Server database via a Comma Separated List and XML. In this post I will describe how to insert multiple rows from a .Net application using the most preferred way, a native feature in SQL Server, Table Valued Parameters. Parameters are place holder for values that are passed from various constructs outside of a programming artifact. We declare parameters all the time, in various technologies, and in various forms - command line arguments, query string values in ASP.NET, sql parameters that carry information to database in a type safe way, etc. In SQL Server parameters are the way to pass and receive information that needs to be dealt with, and information can come from either within SQL Server or outside of SQL Server like from a .Net application. Parameters are generally made of a primal data type like int, char, varchar etc. When such parameters are modeled on some pre-defined table type, such parameters are called Table Valued Parameters. The important words to note here are “table type”. Not table, but table type, which means a user defined type based on some table structure. Table Valued Parameters have been supported by SQL Server since version 2008. 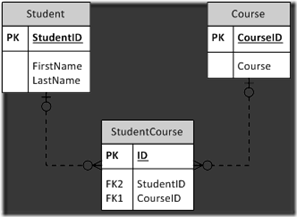 To demonstrate the concept of TVPs, I will be using a very simple data model consisting of three tables: Student, Course and an association table supporting many-to-many relationship between Student and Course, StudentCourse. Making a table type makes the type available in the User-Defined Table Types sub-section of Types section. Execution of the following code should give you some result depending on what you have available in the StudentCourse table. So now that we are through with the basics of TVP, let’s see how we can use them in our main purpose of processing multiple rows of data. To demonstrate this, I will be using a simple web form application powered by the same data model discussed above. 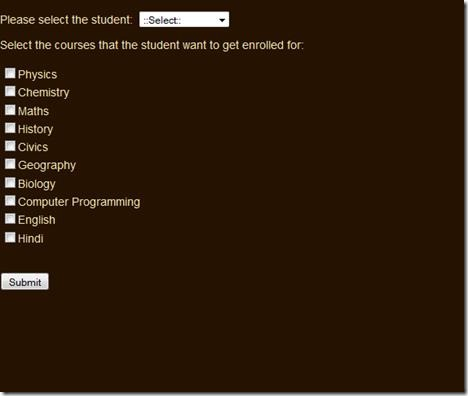 The application helps a student get enroll in the course(s) of his/her choice. 1. Web application’s repository method which parses the incoming object data into a datatable. 2. The stored procedure responsible for receiving the data in the form of a table valued parameter and using it to feed data into the desired table. 1. We are passing the datatable to the SQL Server database to be processed. The datatable is modeled on the table type present in the SQL Server database, used by the table valued parameter. 2. The SqlDbtype of the SqlParameter is set to Structured type. This is strictly done to improve the readability of our code and convey meaning in an explicit way. ADO.NET will perfectly parse the datatable correctly had we not declared the SqlDbType to Structured explicitly. 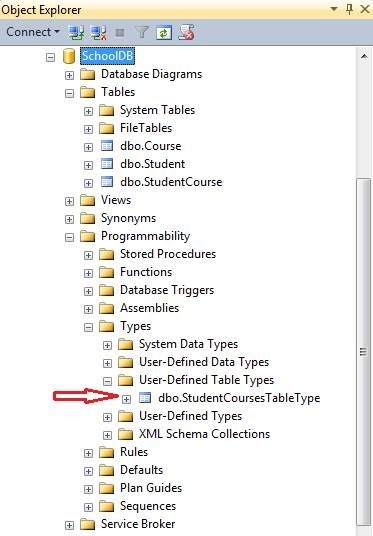 Following is the SQL script of the dbo.EnrollStudentInCourses responsible for parsing the data in the @StudentCoursesTVP table valued parameter correctly. If you go and read my two other posts on inserting multiple rows using a comma separated values list and XML, you surely will come to the conclusion that using table valued parameters is the cleanest approach, that doesn’t include any code acrobatics either in .Net code or in SQL code. Not only that, table valued parameters code is highly performant as long as there’s reasonable data involved.